SAN FRANCISCO, CA and CARSON CITY, NV--(Marketwire - July 15, 2008) - Plasma system engineers from Plasma Etch, Inc. at SEMICON West announced Tuesday that the company has integrated a scroll oil-free vacuum pump into the console of its PE-100 benchtop surface-modification system to replace the system's auxiliary oil-filled pump. The company's migration to the scroll oil-free pump is largely intended to remove the need for wafer processing and IC packaging engineers using the system to monitor the pump's oil level and clean any oil discharge created by exhaust or backflow into the chamber, said John Wood, a Plasma Etch systems engineer. The scroll pump, Wood said, effectively facilitates the setup and operation of the benchtop surface-modification system as engineers no longer need to use compressed air or perform any major assembly. "The scroll pump pretty much makes it a plug-and-play system," Wood said. "To begin treatment, you're basically talking about uncrating the system, plugging it in to a standard socket and connecting your process gas." Plasma Etch's PE-100 is designed to allow wafer processing engineers to etch patterns on silicon dies via reactive ion etch (RIE) and perform photoresist removal. Wood added that the system allows IC packaging engineers to treat wire bond pads and ball grid array (BGA) pads with the system's highly ionized gas to remove contamination and improve interconnect pull, flow and encapsulation. "Contaminants on untreated bond pads are certainly going to compromise electrical connections and, ultimately, impact yield down the line," Wood said. At the board level, engineers treat PCBs in the system's vacuum plasma chamber to remove contaminants to improve bond and wet-out across board substrates during conformal coating of boards. Plasma Etch will demonstrate the PE-100 at this year's SEMICON West at booth 7652 in the West Hall, Level 1. The benchtop system was developed by Plasma Etch to give users an alternative to outsourcing or investing in major capital equipment. The system's plasma-treatment process works to clean surfaces for production by removing organic materials without creating waste that is toxic to workers and a financial burden for users to discard, according to Wood. 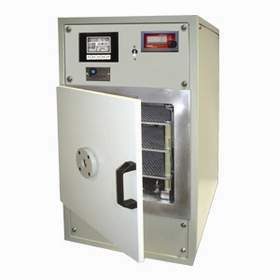 The PE-100's key components and specifications include its 12" x 12" x 12" aluminum vacuum chamber with 240 square inches of processing surface over three 9" x 9" horizontal levels of electrode configuration, a touch-screen interface for the microprocessor control system, a digital mass-flow meter with precision needle valve gas control to manage 0-55 CC/min. and a radio-frequency generator and matching network to manage up to 300 Watts @ 1000 kHz. The system can also be outfitted with a second gas channel. For more information on Plasma Etch's stand-alone systems, visit http://www.plasmaetch.com/systems.html. About this company Plasma Etch, Inc.